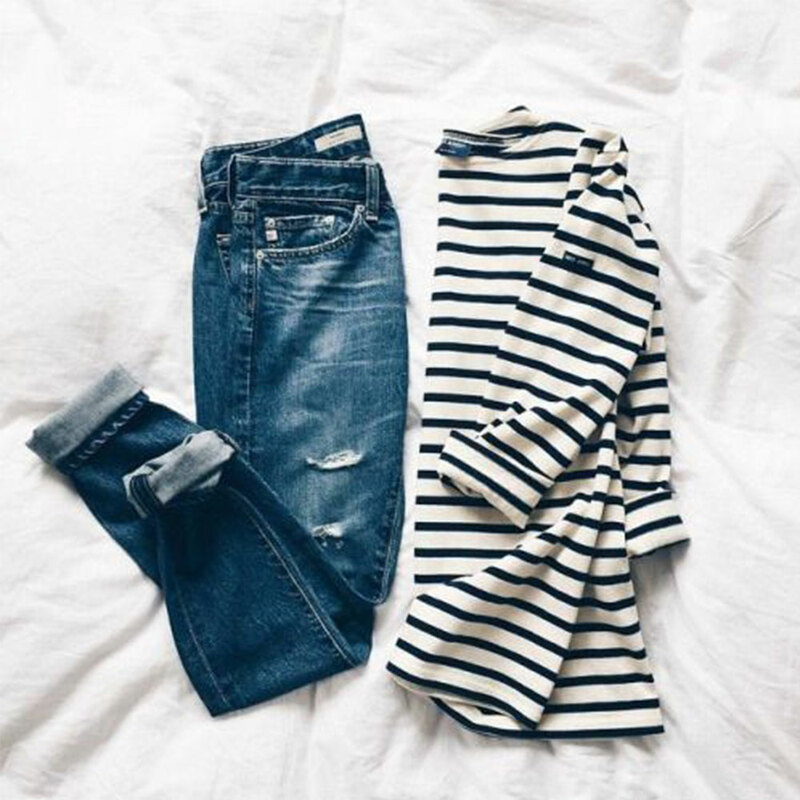 Denim + Stripes. — Striped Intentions / a life and style blog. I love denim. And I also love stripes. So, those two combined are pretty much my go to, not only together (hello, uniform), but also with any outfit. While I may adore the two greatly, I am beyond picky about them. So, today I figured I'd break down my requirements for the perfect stripes and the best jeans, and share my favorites with you. I prefer my stripes to go all the way through the entire tee, meaning no big gaps by the neckline or sleeves. I also stay away from any rings around the collar, as I prefer boatneck styles that don't disrupt the pattern. I'm also weird about stripes being too wide, as I've returned more tops than I care to admit because the stripes weren't quite as thin as I'd like. All in all, I like to keep it pretty classic in this category. My current fave is from J. Crew-- the perfect weight and shape that still washes well. For a less expensive option, I do have a navy tee from Old Navy, although I don't love the dropped shoulders. Otherwise, more generally, Gap knocks it out of the park and LOFT has some winners too. Next up? Boden's classic style is on my list and one day I'll have a closet full of the original Saint James tees. One day. Jeans have been a staple in my closet for more than a decade, and I pretty much only have one rule: skinny legs only. While the wider legs may be making a comeback, there's no way they're coming back into my closet (punny!). However, my problem with denim arises in the fact that I've got a pretty big booty, which often makes finding the right style difficult. In the past, I've loved LOFT's denim legging options (sold out for the season, but they come back every fall and are available still in petite), as they fit me well and stretched nicely. Currently, I'm in between sizes, so I've turned elsewhere for my denim selection-- Old Navy. Now, while I'm a huge Old Navy fangirl, I've never loved any of their denim options, at least until now. They recently overhauled the line and any mid-rise Rockstar pair has worked amazingly well for me. I've purchased many a pair without even trying them on-- something I'd never normally do, like ever. Beyond ON, I tried this pair from Levi's, which I liked but didn't need, so back they went. Pilcro denim was my favorite when I worked at Anthropologie, and they recently re-did their line to feature lots of great styles and washes too! For the future, I've always been curious about the American Apparel Easy Jean, and I'd love to try the uber popular options from TopShop. What are your stripe and denim favorites? I'd love to know!